Angular offers eight hooks to allow you to tap into the lifecycle of directives and components as they are created, updated, and destroyed. 1. ngOnChanges – Called after input and output binding value changes. 2. ngOnInit - Called once the components is initialized. 3. ngDoCheck - Called during every change detection. 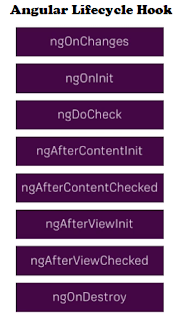 4. ngAfterContentInit - Called after component content initialized. 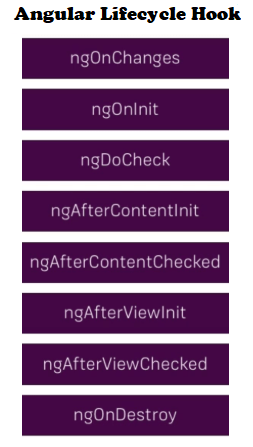 5. ngAfterContentChecked - Called after every check of component content. 6. ngAfterViewInit - Called after a component's and child’s views has been initialized. 7. ngAfterViewChecked - Called every time the component's and child’s views has been checked. 8. ngOnDestroy - Called just before the directive is destroyed. The ngOnInit() and ngOnDestroy() methods play the important roles in the real applications. There are two main reasons to Use of ngOnInit method i.e. 1. The ngOnInit method is used to perform the complex initializations shortly after construction. 2. The ngOnInit method is used to set up the component after Angular sets the input properties. The OnDestroy method is used to clean-up logic and it must run before Angular destroys the directive. If you neglect to call the destroy method that you may risk on memory leaks.